We like food and, let's be honest, eating on a boat always makes food taste even better. But on the boat we don't have an entire cupboard or pantry to keep all the galley gadgets like we do at our house. Instead we have one little corner of an already small cubby so we had to come up with something that could still deliver tasty goodness without hogging the (very) limited space. After hearing positive reviews about the Magma line of nesting cookware, we took the opportunity to use some Amazon gift cards to purchase a set. We opted for the 7 piece thinking that it would be just right for what we need, plus we have a large nonstick frying pan also on the boat. 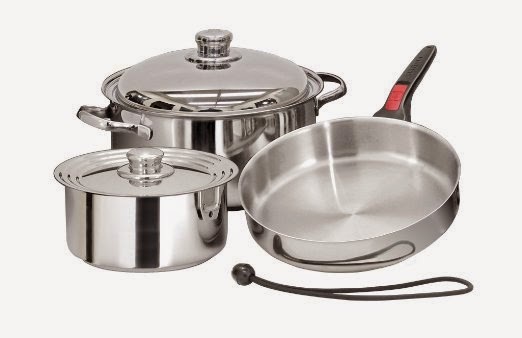 We went back and forth whether to get the non-stick or stainless but ultimately went with the stainless for its durability and lower price tag (of course the non-stick was only available in a 10 piece set). I wanted to get used to cooking with the pans before making a mess on the boat so I seasoned them according to recommendations from the The Boat Galley and have been using them semi-regularly. Note to anyone else seasoning their pans, don't let the pan sit too long after removing the oil...it gets a little sticky and messy. We've never really had that great of luck with stainless pans and I think I figured out why - we never seasoned them! Apparently we totally missed a pretty important part. That, and the fact that we used SOS pads and soap on them (another no-no), totally set us up for failure in the stainless department. Well, that and the fact that Ron likes to cook everything on the highest setting, we had a lot of scrubbing to do. I'm slowly getting the hang of it - I'm glad we still have a non-stick pan on the boat - but I think this stainless set will come in handy too, after learning how to properly use and take care of them of course. We grabbed those suckers at the Miami boat show last year - and I've been very happy with them! Even though the handle counts as a piece, too... ._. We've contemplated getting a pressure cooker but are holding off until we're a little closer to leaving to really decide. They can definitely save propane but we haven't ever used one at home and I'm not sure how much we'd actually use it on the boat. But getting one is a possibility!